Hollywood Decadence reminds me some of the earlier indie polishes that came out a few years ago. 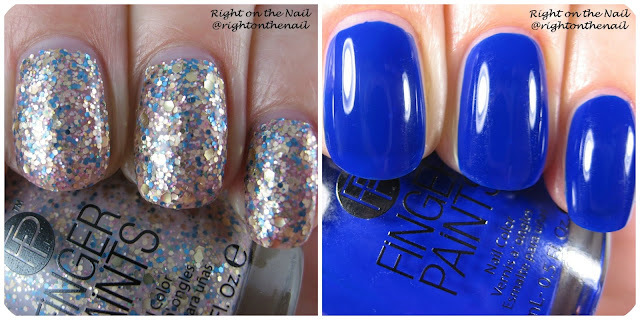 It is a pastel glitter polish with tons of blue, pink and gold glitter in a milky white base. Oh, did I mention that this is a matte polish? I show it matte here, but I ended up putting on a topcoat because it was taking forever to dry...so that's something to consider if you are running short on time. The formula and application were fine even though it was really glitter dense. I used 3 coats for the pictures above, but if you have short nails, or use really thick coats, you may get away with 2. I'm quite oblivious to art so I had to look up who Magritte was. Apparently he was a Belgian artist known for his surrealism paintings. Once I saw some of the paintings I knew who he was. I'm not 100% sure what this beautiful cobalt blue jelly polish has to do with his paintings, but I guess it's a really nice tribute! The first coat was fairly sheer and patchy, but it built up well in 3 easy coats. These usually retail for $5.49, but you can often find them on sale with your Sally's card. Find out more about FingerPaints on their Facebook, Instragram, or Twitter pages.